Groundbreaking new research has traced the source of a wide array of to a single common factor&#8212;vitamin D deficiency. Leading rheumatologist and researcher Dr. James Dowd reveals the causes of vitamin D deficiency and offers a simple, easy-to-follow five-step program that can eliminate or alleviate a host of seemingly incurable conditions, such as arthritis, in as little as six weeks. Better yet, by staying on the program, you can enjoy robust health and improved fitness for the rest of your life. Though I've read the book, I haven't tried the "cure" yet so perhaps I'm not qualified to write a review. But as I read it, particularly the case histories of the people who have been "cured" of depression, aches, brain fuzz, etc I couldn't help feeling I've heard it all before. Because I have, in books about everything from candida to inflammation, which dovetail some of the recommendations here and books that contradict the recommendations here. Some of the purported health benefits of vitamin D can be supported by research found elsewhere, but the megadoses he recommends are dangerously high unless you are under a doctor's care and have been diagnosed with a deficiency. While he makes that caveat, he still encourages readers to self-diagnose a deficiency based upon a couple of questions and provides sources for the high dose supplements. That concerns me. The diet plan is just a rehash of the "Paleolithic Diet" (uncredited) which cropped up 20 years ago and is based on the idea that we should eat only what our caveman ancestors ate because they never got degenerative diseases. Then again, they didn't live long enough to. The author makes some pretty sweeping generalizations, and presents a severely restricted menu plan that nobody is going to be able to stick with for very long without a financial incentive. For example, while a hundred books are now touting the miracle of anti-inflammatory diets that are rich in whole grains, Dr. Dowd puts grains off limits. In fairness, I can already hear commentators saying "Try it first...it saved my life!" But I find it difficult to swallow diet information from somebody who repeats popular myths like "green tea is rich in Vitamin K." (p. 92 hardcover) True...if you digest the leaves. The amount in a cup of tea is negligible. He also states the best time of day to take vitamin supplements is "in the morning right after you eat." Well maybe, unless you're a woman over about 45 whose stomach acid is pretty low at that time of day due to hormonal changes. All the menopause books out there recommend taking them later in the day. I do plan to increase my vitamin D supplementation to 1000 IU daily, seeing as how I live far north and would probably benefit by boosting that. If that's not effective, I'll get tested to see if I have a deficiency that needs more supplementation. And I agree it is good to limit high acid foods and/or balance them with alkaline ones. But the rest of it just feels like the usual perfectionist diet for the severely anxious. Make it harsh enough, and people will experience a placebo effect just because they're paying such a high price in terms of self denial. I know for myself from long experience that many of the symptoms he describes are most consistently managed with stress reduction techniques, meditation and exercise. Diet absolutely figures in, but there's no magic bullet. But his recommendations are simply too severe and not sustainable. People will end up feeling like failures when they sneak a piece of cheese, and therefore will feel stressed, get anxious, tighten their muscles, have pain, and 2 years from now will be looking for yet another "cure." Both my spouse and I are physicians. 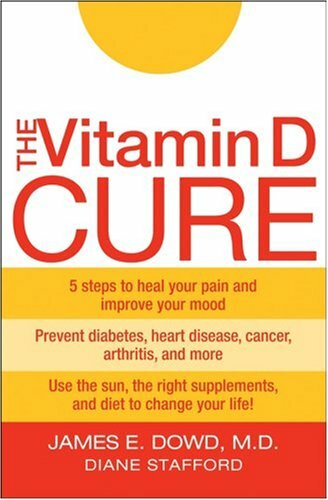 When we read this book, we were shocked to realize how little we had known about Vitamin D. Following Dr. Dowd's suggestions, we began taking Vitamin D from one of the sources listed in the book. 1.) gums/teeth -- we had both had some gum recession over the years, with associated tooth sensitivity. We had asked dentists, orthodontists, periodontists, and oral surgeons why gum recession occurs. They all said, "It just happens." That never made sense to us, and it is now apparent that they simply did not know about the Vitamin D connection. Our gums now look healthier, and the tooth sensitivity is gone. 2.) tendon/ligament/fascia pain in the ankles and feet -- gone or greatly improved. 3.) skin -- smoother, fresher look with decreased prominence of pores. This isn't talked about in the book and so it was unexpected but most welcome. My personal belief is that it may be related to improved immune function with Vitamin D.
Within four weeks, we had increased muscle strength and decreased muscle fatigue on exercising. An interesting aspect of this is that we live in Florida, where you might think it would be difficult to be Vitamin D deficient. However, we work inside all week, and when we go out on weekends we use sunscreen or sun-protective clothing. This book is thoroughly researched and referenced. It is full of specific advice on testing for deficiency, supplements, dietary changes, sun exposure, and more. It discusses the various health problems that Vitamin D can make a difference in, including arthritis, osteoporosis, high blood pressure, heart disease, seasonal depression, diabetes, colon cancer, and many more. It is important to note that magnesium is essential along with Vitamin D. Though this is discussed in the book, I strongly recommend also reading "The Magnesium Factor" by Mildred Seelig, M.D. It is also excellent and extremely helpful. We have added more magnesium-rich foods to our diet based on Dr. Seelig's advice, and also decided to take one of the magnesium supplements she mentions. In summary, I think most people could benefit from reading this book and "The Magnesium Factor".